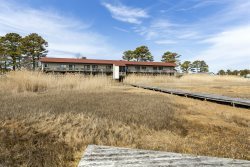 Meridian 601 West in OCMD offers Unparalleled Vacation Luxury. Absolutely stunning Ocean & Bay Views from this spacious Home - New Balcony Furniture is on the way. You can see forever from the comfort of the Living Area. This gorgeous Vacation Home sleeps 12 comfortably in 4 spacious Bedrooms. The Meridian is in a great Location on 60th Street - quiet, yet close to everything. Kick off your Flip Flops in the welcoming Foyer and let the Vacation Fun begin. Everything is Brand New is this Newly Renovated Condo. Just look at the Views you`ll enjoy while Dining. Soothing Coastal Colors & Professionally Decorated throughout. Plenty of room at the Breakfast Bar for a quick bite before hitting the Beach. The Chef will love the Gourmet Kitchen with Granite Counter Top & Stainless Appliances. Top of the Line everything is the Gold Standard at The Meridian. Fabulous Open Floor Plan makes time together easy. Enjoy Dining Indoors or Al Fresco on the Newly Furnished Balcony with astonishing Vews. Three Parking Spaces are available for you, with additional street parking. Brand New High End Furniture arriving soon..... Watch the Waves crash on the Beach as you sip your morning coffee. Oversized Luxury Wicker will be here for your enjoyment this Spring. Stunning Master Bedroom with King Bed and amazing Views & Access to Ocean View Balcony. Soothing Colors of Dune Grass & Coastal White promise a soothing night`s sleep. The Master Bath with Custom Hand-Painted Murals will leave you speechless. There is also a Glass Walk-in Shower with Custom Tile in the Master. Granite Double Sinks & beautiful Decor throughout.... The Soaking Tub is truly a Spa-like Experience. Bedroom 2 is also a Master and has a Queen Bed & stunning combination of Coral & Aqua. Bedroom 2 also has a Private Master Bath. Custom Glass Walk-in Shower is so luxurious. Bedroom 3 has a 2 Twins plus 1 Trundle and a tranquil Starfish Theme. The 4th Bedroom has a Pyramid Bunk with Twin Trundle and sleeps 4. A great room for the Kids - there`s even a Flat Screen TV when some down-time is needed. A Jack & Jill Bath is shared by Bedrooms 3 and 4. Fun Blues & Oranges and a Tub/Shower Combo..... Even the Laundry Room has a touch of Luxury.... Lovely Half Bath is convenient to Living Area and Kitchen. Your Private Beach Access is only steps away. Walk to Dining, Activities, and more from this awesome mid-town location. Glass Balconies ensure every Condo has incredible, unobstructed Views. Meridian Guests have access to the Heated Rooftop Pool, as well. Stay on track with The Meridian`s 2,000 sq ft Fitness Center. There is something for everyone in your family. Strengthen & Tone with some Weight Training. State of the Art Equipment..... Climate Controlled for your comfort. OC Beaches are among the cleanest on the East Coast. So much to do in family-friendly OCMD. Take in Sunrises over the Ocean..... Be sure to visit our Famous Wild Ponies at Assateague. Looking for a dream vacation home that can accommodate the whole gang? This spectacular 4-BD, 3.5-BA condo has the perfect layout for a large family or 2 families to share with both a Master Suite and Jr. Master, and is loaded with all the bells and whistles - with more than enough room to give everyone their space! Upon entering Meridian 601 West, Dune Grass Greens and Coastal Corals mix with warm sandy beaches to transport you to a Tropical Paradise. Inhale, Exhale, and Relax - You have arrived! Meridian 601 West will surround you with beauty in every direction. With phenomenal Views of both the Ocean & the Bay, you may never want to leave. This gorgeous Condo just had a complete Makeover and is Like New in every possible way. Relax in the spacious Living Area and sink into oversized furniture after a fun-filled day on the Beach or at the Rooftop Pool. You can take in these amazing Views right from the sofa, if you like! Loaded with Flat Screen Cable TV, Free WiFi, and every luxury imaginable, there's nowhere better to be! Or wander outside to the huge Balcony and take in sweeping Views of the Ocean, Bay, and all of OC. Furnished with Brand New Outdoor Furniture, it's a wonderful place to begin each day with a Sunrise over the Ocean and a fresh cup of coffee. Watch the waves crash on the Beach, and take in that salty, sweet sea breeze. The Kitchen is sure to please the Chef in your family with Gleaming Granite Counter Tops, High-End Stainless Appliances, and everything you could possibly need to make mealtime a bay breeze. Dine indoors at the oversized Dining Table with exquisite Water Views, or Al-Fresco on the Balcony. Don’t feel like cooking on Vacation? No worries - enjoy a stroll to one of many excellent restaurants within walking distance, including Fager’s Island, Mackey’s, Dead Freddies, OC Brewing Company, and More! Sleeping 12 in 4 spacious Bedrooms, no one will ever feel crowded at Meridian 601 West. With both a Master Bedroom and a Junior Master, it is ideal for 2 small families to share, or for your large family! The Master Bedroom is breathtaking with Colors of Dune Grass & Sand - beautifully & artistically presented. You'll sink into the comfy King Bed - there is even Flat Screen Cable TV and access to the Balcony with amazing Ocean Views. Sneak out to gaze at the stars while everyone else slumbers. The Spa-like Master Bath is truly an experience. With Custom Tile, Double Sinks with Granite, a huge Jacuzzi Tub, and an oversized Glass Walk-in Shower, you may never want to leave the bathroom! The Custom Hand-Painted Murals are simply inspiring. The 2nd Bedroom is a Junior Master with a Queen Bed and another Private Full Bath. Warm & welcoming with cheerful Aqua & Coral, beachy White Furniture, and another Flat Screen Cable TV, there is so much space to stretch out and relax. There is also another Private Master Bath with Walk-in Glass Shower. Down the hall are 2 more spacious Bedrooms that share a Jack & Jill Bathroom with Tub/Shower Combo. Bedroom 3 has 2 Twins Beds, one with Twin Trundle, Beachy Blue Walls, and a cheerful Starfish Theme. Bedroom 4 is perfect for the kids with a Pyramid Bunk Bed with Twin Trundle. Both Bedrooms also have Flat Screen Cable TV, as well. And not that any of us like doing Laundry, but the High End Full Size Washer & Dryer conveniently located in the spacious Laundry Room certainly will come in handy! The Meridian Condominium sits on the oceanfront and 60th Street and features two buildings. Meridian 801 West is in the Ocean Block Building, mere steps away from the Beach Access. The views in every Condo are enhanced by a glass railing system that wraps every oversize, Happy- Hour worthy balcony. Meridian Guests have access to Exclusive Amenities, including a Rooftop Heated Pool, Huge Fitness Center and Outside Shower for rinsing off after fun in the sun. With easy access to the Route 90 bridge and in an excellent, quiet mid-town location, The Meridian offers every extravagance you could want in your Ocean City vacation in a quiet location, yet convenient to everywhere you want to be.